Maybe some of you already wanted to add your own video to Generals but found that generals used Bik files, than this "Tutorial" will show you how to get your video into a ,Bik format. 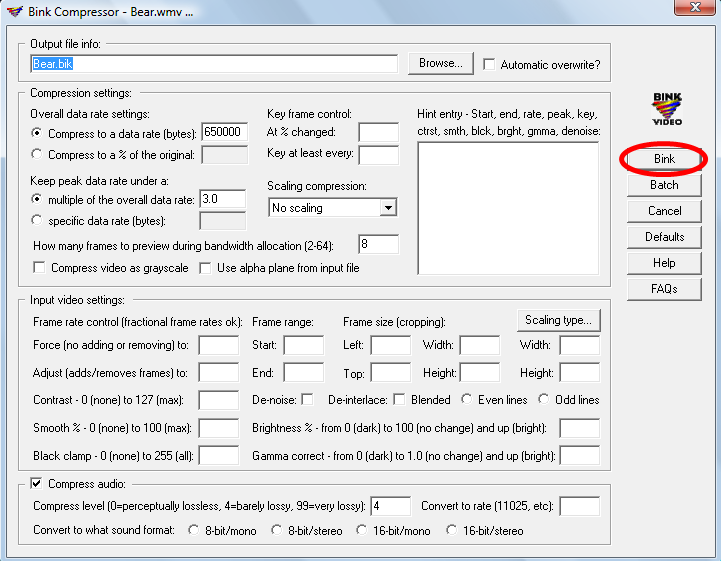 Simply use Movie maker or another program, or record part of a scirmish with a recording program like AutoScreenRecorder. Now we have our movie and RAD Video Tools, RAD Video Tools can open quite a substantial ammount of file types, so lets assume the movie is in an openable format. 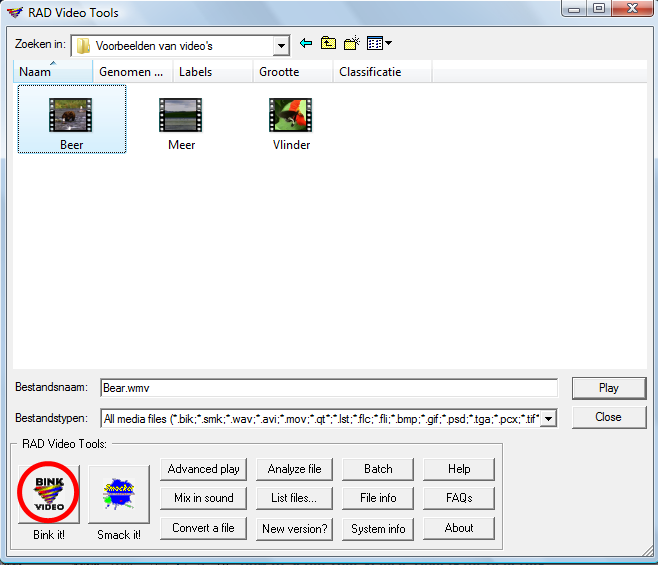 Now what we do is opening the file with RAD Video Tools, you'll be presented with a screen similar to that in the picture. I put a red circle around the Bik button, pressing that button opens up a new screen in which you can adjust some settings. The seccond screen I've also added, I also marked with red the converter button so it'll be easy to find. Pressing that button closes this screen and opens another, that screen shows the progress of convertion. Converting a movie or video takes quite a lot of time, when having one minute of film, then ten minutes of converting time is a reasonable guess. 5 Press the "Bink" button, and wait till it's converted. 6 Name your new .bik file after the filename of the video you wish to repace, or... open up GameData.ini and edit the name of the intro movie to match yours. it's never able to open any file format. Do you get any error message, or use a 64bit system, OS other than windows? That way i can see if i can help to find a solution. Only error message I get is " Error opening file "
I've tried every file format they have for opening. All the same. looking at their FAQ http://www.radgametools.com/binkfaq.htm tells me bink uses stuf from other applications: "The RAD Video Tools uses QuickTime to import compressed sound formats." however without having quicktime(at least i never told to install it), just vlc at home it still works. Hmm, i'm not very fond of quicktime, but do you have it installed? I'll also check if i have it home(just to be sure) to before advising to install it. Note: my dislike of quicktime mainly comes from my liking of vlc, and the anoying way apple software update tries to install iTunes and Safari with it(where i dislike iTunes for it being slow on my system). I do have Quicktime.. at least, a quick search through my programs says I do. I've run through their FAQ before, and I couldn't find anything to solve my problem. I've run it as Adminstrator, I've given full permissions to the formats I've tried. Searching through google tells me more people have this problem, and especially on windows 7. Now i used to run it on windows 7 without problem, strange. I have a friend with windows 7 64bit, but there it does work, the problem with disfunctional software is it's always annoying to find the cause. -asking at their helpdesk, which i'll do when it isn't solved soon. -i'll convert them for you. I have a friend with windows 7 64bit, but there it does work, the problem with dysfunctional software is it's always annoying to find the cause. I also checked official Phallosan Forte tutorial/review compilation mensreviewzone.com/phallosan-forte-reviews/ and how to use the guide here. I am Windows 8. Still getting this error message.
" Error opening file "